Grape vines are prone to mutating and winemakers prone to taking advantage of the results. One not uncommon example is red grape vines that mutate into white grape vines. Henri Gouges has a famous row of white Pinot Noir vines, propagated from an offshoot discovered in the 1940s, whose white berries are vinified to make a blanc de blancs (as opposed to a blanc de noirs, a white wine made from red grapes by minimizing the juice’s contact with the pigments in the skins). Tempranillo Blanco, a white mutation of Spain’s iconic red grape, was discovered in 1998 in Rioja Baja. (A grey-berried mutation called Tempranillo Royo or Tempranillo Gris has also been found in Toro.) After several years’ work to stabilize the variety, Tempranillo Blanco was authorized for use in white Rioja in 2004. Under the appellation rules, the grape can be used on its own or in blends, with Viura (aka Macabeo) generally considered the best blending partner. 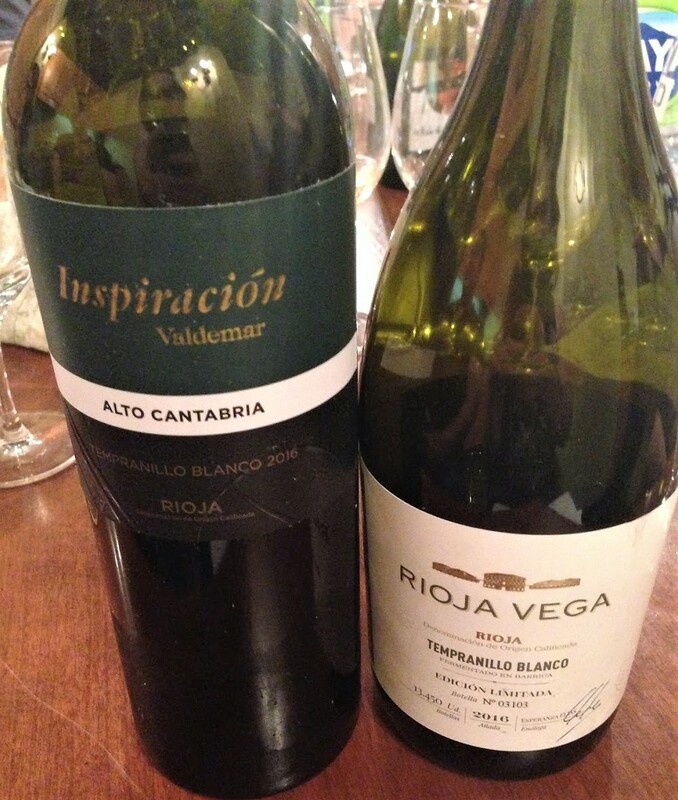 Two monovarietal Tempranillos recently showed up at the SAQ and we gave them a try. 100% Tempranillo Blanco sourced from the Alto Cantabria estate. The estate claims this was the first wine made from the grape; Jancis Robinson’s Wine Grapes says that honour goes to Ijalba. Fermented and matured on the lees in temperature-controlled (16°C) stainless steel tanks. Reducing sugar: 1.4 g/l. 13.5% ABV. Quebec agent: Oneo. 100% Tempranillo Blanco. After alcoholic fermentation, the wine spent six months on the fine lees in French oak barrels. Reducing sugar: 1.4 g/l. 13.5% ABV. Quebec agent: Importation Épicurienne. 100% Tempranillo from organically farmed vines in three parcels with chalky-claey soil around the village of San Vicente de la Sonsierra, Rioja Alta. In a quest for freshness and lower-than-usual alcohol levels, the grapes are picked (by hand) earlier than at most other estates in the region. Undergoes partial carbonic maceration. Fermented in concrete tanks. Reducing sugar: 1.3 g/l. 13% ABV. Quebec agent: Boires. I’d seen this recent arrival on the monopoly’s shelves but my interest wasn’t really piqued until I read Karyne Duplessis Piché’s profile of the estate in Friday’s La Presse and the companion piece about the attempts of a handful of iconoclast producers to open the Rioja appellation to a more terroir-driven approach. Estate-grown Tempranillo (75%), Garnacha (15%) and Graciano (5%) and Mazuelo (aka Carignan, 5%). Manually harvested. Fermented with indigenous yeasts. Matured in estate-made American oak barrels for six years, with twice yearly racking. Fined with egg whites. Bottled unfiltered. 13% ABV. Quebec agent: Rézin. 100% Viura (aka Macabeo) from old vines. Manually harvested, gently destemmed and immediately crushed. The must is transferred into 60-hectolitre oak vats, where it ferments spontaneously. Matured in 225-litre American oak barrels for four years, with racking twice a year. Unfiltered but fined with egg whites before bottling. Reducing sugar: 2.4 g/l. 13% ABV. Quebec agent: Rézin. Tempranillo (85%), Graciano (10%) and Mazuelo (aka Carignan, 5%) from vines averaging more than 20 years old in Villalba and Haro in Rioja Alta. Manually harvested. The grapes were destemmed and cold macerated prior to cool alcoholic fermentation in oak vats and malolactic fermentation in barrels and cement vats. Matured 36 months in American and French oak barrels and 48 months in the bottle. 13.5% ABV. Quebec agent: LBV International. Tempranillo (90%) and Graciano (10%) from vines over 40 years old in Briñas, Labastida and Villalba. Alcoholic fermentation took place in stainless steel tanks. Matured 48 months in four-year-old American oak barrels (made in-house), with racking every six months. Bottled in November 2010. Reducing sugar: 2.0 g/l. 12.5% ABV. Quebec agent: Vinicolor. Both wines were carafed and poured back into the bottles about four hours before we got around to them. Tempranillo (84%), Garnacha Tintorera (13%) and Mazuelo (aka Carignan, 3%). The grapes are destemmed, crushed and fermented in temperature-controlled stainless steel tanks for ten days with daily pump-overs and punch-downs. Matured 25 months in American oak barrels and 36 months in bottle before release. 14% ABV. Quebec agent: Bergeron-les-vins. Tempranillo (80%), Mazuelo (10%), Graciano (5%) and Garnacha (5%) from vines averaging 35 years old. Manually harvested. Fermented in oak vats with indigenous yeasts and without temperature control. Matured nine months in new oak barrels and 27 months in “semi-new” American oak barrels and at least 36 months in bottle. 14% ABV. Quebec agent: Vins Balthazard. “After these wines, you need to floss,” quipped one taster. Not that that stopped him from polishing off both glasses. 100% Garnacha (aka Grenache) from 40- to 90-year-old vines. In previous vintages, the wine has been a blend; the 2010 is the first all-Grenache bottling. The grapes were manually harvested, sorted in the vineyard and again at the cellar and fully destemmed. Fermentation with indigenous yeasts and maceration with regular punch-downs took place in 5,000-litre oak vats and lasted nearly a month. Matured 14 months in French oak barrels, 50% new and 50% second-fill. Unfiltered and unfined. 14.5% ABV. Quebec agent: Les vins Horizon. Mostly biodynamically farmed Grenache (84%, from the Alta Loma vineyard in Greenfield) with a little Syrah (11.5%, from the Alamo Creek Vineyard near Santa Maria) and Mouvèdre (4.5%, from very old vines in Oakley). Manually harvested and sorted. Mostly destemmed. The varieties were vinified separately. A cold soak of several days was followed by lengthy fermentation (with indigenous yeasts) and maceration in open vats with regular punch-downs. Matured in stainless steel tanks, then blended and bottled. Screwcapped. 14.4% ABV. Quebec agent: Trialto. An unusual blend of the seven grape varieties, including white, permitted in Rioja: Tempranillo (55%), Garnacha (15%), Graciano (15%), Mazuelo (7%), Viura (7%), Malvasia (2%) and Garnacha Blanca (1%). Manually harvested. The varieties were vinified and matured separately in French and American oak barrels for three years, then blended and aged another 12 months in French oak foudres. 14.5% ABV. The Cellier New Arrivals wine in this flight. Estate-grown Tempranillo (75%), Garnacha (15%) and Graciano and Mazuelo (10%). Manually harvested. Fermented with indigenous yeasts. Matured in estate-made American oak barrels for six years, with twice yearly racking. Fined with egg whites. Bottled unfiltered. 13% ABV.